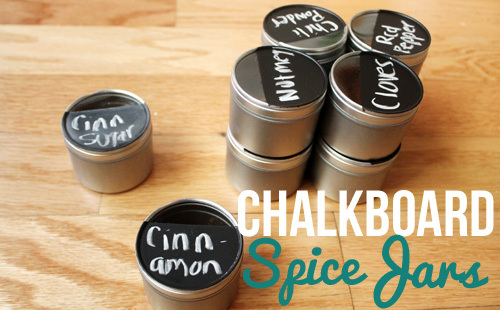 I ordered 25 spice jars (from here) and already had some painters tape and chalkboard spray paint laying around from other projects. 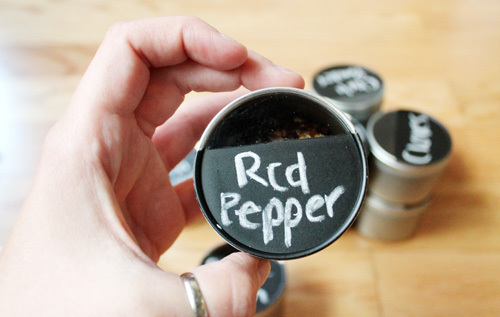 I cleaned out my spice jars with a damp paper towel to get any dust out. Because I would be writing on them with chalk, and there was a possibility it could rub off in the drawer, I didn't want to paint the entire lid. I taped off a section that was less than half of the top for a window, and then taped around the sides for a clean line around the lid. 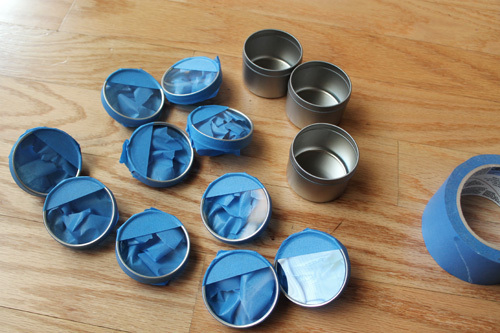 Watching Unsolved Mysteries while taping all your lids make the time go faster. I'm just saying. 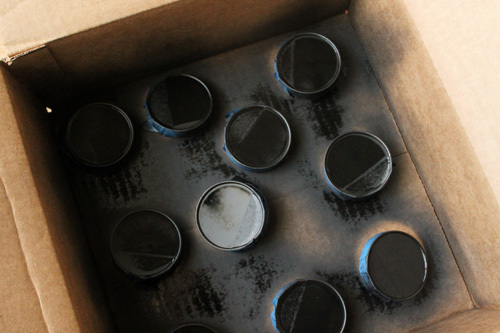 If you want to be responsible, take for lids and place them in a box outside for spray painting. Or you could do it in your living room like me. (It was raining...) You want to do two or three even coats, letting dry in-between. And that's it! 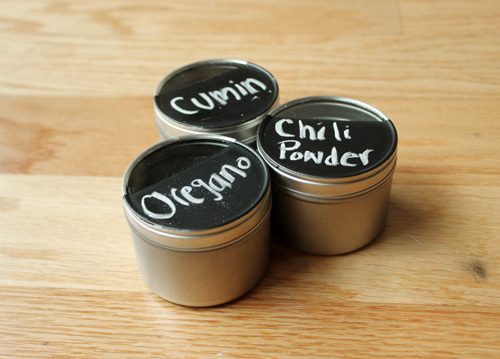 Take the tape off, scratch off any paint that weaseled under the tape, and start labeling your spices! 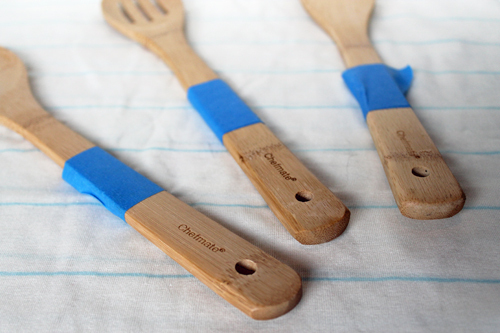 This is a great one-afternoon project, as it only takes about an hour with the drying time. So far, I love them. They function exactly how I wanted them to and fit in the empty drawer perfectly! Woo. These are so easy, they don't really warrant a walk through, but I'm so nice that I provided one anyway! 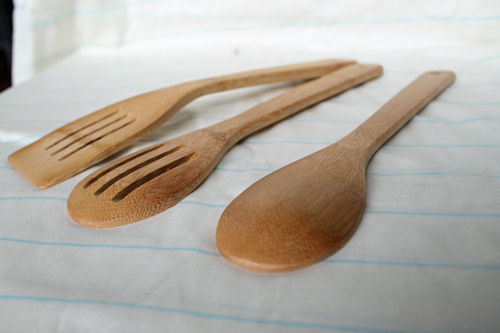 You'll begin with ordinary bamboo/wooden kitchen utensils. Using painter's tape, tape off the ends that you want to paint. Make sure to get a straight line, and each one is around the same size of painting area. 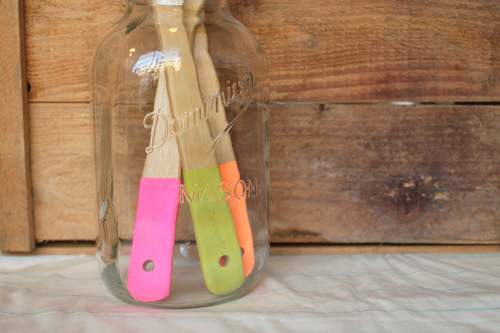 Using any color craft paint (I used neon orange, pink, and chartreuse), paint the ends of each utensil. At first, this will seem like it will never cover, but several coats later and there you have it. I did around four coats, I believe. 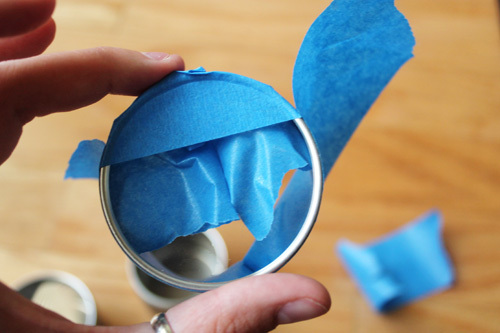 Remove the tape and let dry completely before using. Now, these obviously aren't dishwasher safe, but very fun. 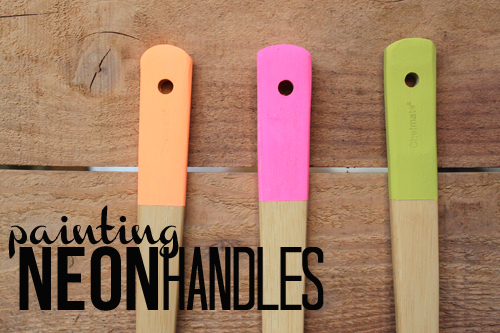 Enjoy cooking with your pretty new spoons and spatulas! I might make a few more of these, and they would make lovely housewarming gifts!